Fjords & vineyards: the sunniest spot in New Zealand offers serious opportunities in the primary sector and tourism. Tucked at the north-Eastern tip of the South Island, Marlborough boasts stunning scenery and wonderful fjord walks. What’s more, its dry climate nurtures some of the best vineyards in the country. 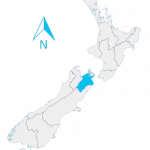 Marlborough is tucked in the Wairau Plains, between the Kaikoura ranges in the south, and the Marlborough Sounds, in the North. Polynesian settlers were present in the region in the 13th century, with fish, sea mammals, and birds supporting their lifestyle. Māori developed canals all over the region to further establish their settlements. Captain James Cook dropped anchor in the Marlborough Sounds in February 1770. The following century saw a flourishing whaling industry which, due to intensive exploitation, did not last long. Grazing and agriculture (barley, wheat, vegetables) quickly came to dominate the trade while milling became a secondary but important industry. The 1970s saw the birth of a now-dominant wine industry. Marlborough’s main city, Blenheim, with just over 30,000 residents, is the gateway to nearby tourism activities while catering for the region’s wine trade. Nearby mountain ranges shelter the plains from rain. As a consequence, summers are typically warm and dry (averaging 20-24C), with winters delivering the occasional frosty morning with clear, sunny days to follow (12-14C). The local climate means the region is popular with holiday-makers and retired people alike. Ferries travel daily between Picton, 1 hour’s drive north of Blenheim, and the capital Wellington, 3 hours by boat across Cook Strait, zig-zagging around the Marlborough Sounds. Their countless fjord walks are one of the highlights of the region, with Queen Charlotte track an extremely popular hike. Wine experts have tagged Marlborough the best place in the world for Sauvignon Blanc grapes, and the region has definitely put New Zealand on the world wine map. Along with permanent and seasonal jobs, the wine industry also provides major tourist attractions. Outdoor activities are plentiful with the ocean and mountains providing hiking, cycling, mountain biking, fishing, or boating opportunities. Aquaculture and farming are important industries in which lie many Marlborough jobs. Yet, grape-growing is by far predominant. In just under 30 years, the region has established a world-class standard for Sauvignon Blanc and is in constant need of seasonal, permanent, and skilled workers. Tourism has also grown more diverse of late and its importance is not to be overlooked, with vineyards, fjords, and whale watching adding a special touch to the usual list of New Zealand outdoors activities.